That doesnt mean we’re totally in the dark. We know that we use clothing to regulate body temperature. It seems obvious that it’s involved in social signaling, otherwise we’d fully relinquish our duds in warm weather. But good luck finding a textbook that explains how that social signaling works, why we often dress at odds with temperature regulation or the empirically derived purpose of neckties. An astronomer can easily tell you what phase the moon will be in on July 24th, 2097, but nobody can accurately predict what your sister will wear tomorrow. That’s kind of fantastic. And it’s not like a theory of clothing is esoteric. The world apparel market is worth some $1.7 trillion yearly and about 75 million people are involved in making those clothes(ref). Shouldn’t we know why they do that? And wouldn’t it be handy for a trillion dollar industry to have some method for forecasting demand? Because right now it’s partially done by designers looking at rocks in their pockets. We can do better. Here’s an article that takes an opening stab at the problem. 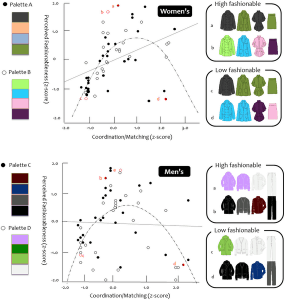 Kurt Gray, Peter Schmitt, Nina Strohminger and Karim S. Kassam’s recently published “The Science of Style: In Fashion, Colors Should Match Only Moderately.” If you don’t like reading scientific articles, it’s pretty well digested on Slate. The article’s findings—that clothing should match, but not too much—include equations and a graph. This is fantastic not because graphs and equations are themselves fantastic (though they are), but because someone is finally asking structured questions about what all this fabric is doing around our bodies. And asking in a way that tries to make predictions. Because these styles must mean something, and something pretty important considering we’re spending 1.7 trillion dollars to drape them around us. “Wearables” are all the rage with tech writers and venture capitalists, but how can we make great wearables until we know what and why we wear things in the first place? A theory of clothing could do that. Is anyone else in science studying clothes? I’d love to hear about it.